« How Do I Choose a Mirrorless Camera? Note: this article was written when the norm for mirrorless cameras was to have an optional EVF, not a built-in one. Much of the time handheld shooting boils down to this: DSLR users hold cameras up to their eyes, compact camera users hold cameras at arm's length in front of them. So what about mirrorless users? Well, we do both. The usual indictment of arm's length shooting is this: you can't hold the camera as steady. There's also a more subtle issue which is that as you get older presbyopia might make it difficult to focus on the camera's LCD while you're operating it that way. My eyesight is just about right for arm's length LCDs, but I wear glasses for distance, so I find that I'm constantly flipping my glasses in and out of the way when I shoot with a camera and framing via the rear LCD. Over the years I've had a heating debate with my Web site visitors and workshop students about the "in between" options. For example, a handful of compact cameras have had very inaccurate optical viewfinders (typically 70-80% view, and prone to parallax issues). 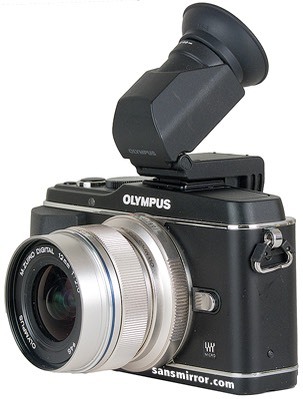 The other option is an EVF (electronic viewfinder) in place of the missing optical chain of a DSLR. At present, the only mirrorless cameras to have a true "optical viewfinder" would be the Leica M series, which has a variant of their traditional rangefinder, and the Fujifilm X-Pro1, which has a hybrid optical/EVF viewfinder. You either like that option or you don't, as rangefinder viewfinders are a breed in and to themselves. 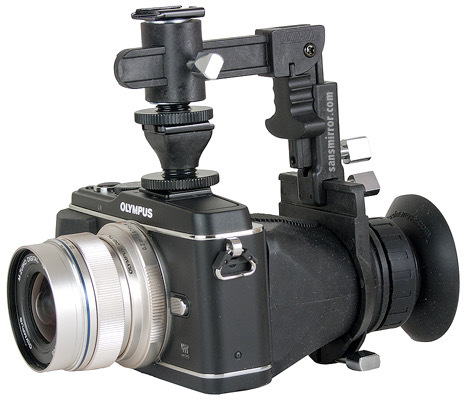 You can also find optical options that fit into the hot shoe or accessory slots of the Sony and Olympus cameras (and you can use existing optical framing devices in most cameras that have hot shoes aligned with the lens). The problem I have with these optical solutions is that they typically use frame lines to suggest where the edges of the frame might be. I can pretty much guarantee that the actual edges of your composition won't be at those frame line positions, and how accurate they will be to use for composition is going to be dependent upon how you "interpret" those frame lines, especially with near subjects. Since a lot of people crop their images after the fact, the inaccuracies don't seem to bother them much, but I personally don't like wasting pixels. If you don't mind post processing and you aren't pushing print sizes up, then maybe you won't mind an optical eyelevel viewfinder. It's worth checking out if those things apply to your shooting. The EVF solution is available for most mirrorless cameras (and is built in to some: Fujifilm X-Pro1, X-E1, Nikon V1, V2, Olympus OM-D EM-5, Panasonic GH2, GH3, G3, G5, Samsung NX11, NX20, Sony NEX-6, NEX-7). An EVF is not a perfect solution, either. It's a small (typically 1/2"), flat, two-dimensional video screen. There's something about having a flat screen that close to your eye (usually set to appear about 1m away) that makes composing a bit different. It doesn't help that there's a slight lag between what's happening in front of the camera and what you see on the screen. In the best displays, that lag is now minimal, but it's still there, so you have to learn to anticipate and time your shutter release even more than usual. Many EVFs drain batteries fast, too. In some cases very rapidly. Having a lit screen in your eye in low-light conditions (twilight, dusk, dawn, night, etc.) impacts your eye's dark adaption routines. In extreme situations you'll find that when you look through the EVF and then take the camera away from your eye you can actually see the echo of the display as your eye/brain scrambles to move from its bright adaptation (cones) to dark (rods). One other problem with the external EVFs is that they are typically an expensive add-on. On the plus side, an EVF shows you 100% accurate framing and usually plenty of exposure and camera setting information (though a few just repeat the clutter that's on the rear LCD, which is annoying). Most of the first generation of EVFs are all about VGA equivalent (640x480) in resolution, which is a bit coarse when looked at that close, but we're now seeing far higher resolutions starting to appear (e.g. NEX series). In bright light, an EVF tends to be more usable than some of the rear LCDs, which wash out and are hard to see clearly. So we're back to the question that's the headline: do you need an eye level viewfinder? They're certainly a help. As I noted, in bright light, the rear LCD on many mirrorless cameras gets difficult (and in some cases impossible) to use. But the thing I find most helpful is simply that using an eye level finder gives the camera three points of stability (left/right hands, face) instead of two that are awkward (left/right hands extended). So you'll often find me carrying an optional EVF. But what works for me much of the time is a completely different accessory: the LCD hood. My favorite in this respect is the Hoodman Cinema Kit Pro (you might also need the HoodBoost Adapter), which is shown above. While it makes for an ungainly looking contraption in permanent mode, it works decently once you get it set for your camera, as it just slides in and out of the hot shoe. What you're doing is essentially putting a hooded loupe on the back of your camera's LCD. The camera obviously needs to have a hot shoe to use this accessory, but it's a bit cheaper than many EVF options, and doesn't further drain your batteries. You can also just hang the loupe itself around your neck and use it manually over the LCD and skip the Rube Goldberg contraption that holds it in place. Other similar solutions exist, including the expensive Zacuto Z-Finder system. Most of these hood loupes were designed for using still cameras as at-the-eye video cameras, but they're trying to solve the same problem: make the main LCD on the camera act as a reliable viewfinder in handheld situations.